Ahh-spirations Therapeutic Massage is owned by Becky Lockwood working in Oakland. Becky graduated from Waverly-Shell Rock High School, and then from American Institute of Business in Des Moines. In 2012, Becky graduated from Ancient Wisdom College of Healing Arts with the desire to assist those who strive for better health and well-being. 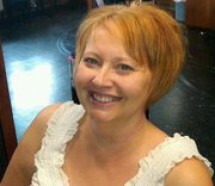 Her change of career enables her to inspire clients, as well as herself to "relax and renew". Mother to four and grandmother to seven, massage is relaxing and centering for her as the therapist which helps balance the rest of life! Being a licensed massage therapist (LMT) and nationally certified in therapeutic massage and bodywork (NCBTMB), opens an avenue to help people in areas that are of interest to her such as health and nutrition. Late 2015, and continuing in 2018, Becky is now a student/Associate of Ortho-Bionomy. This will be invaluable to assisting her clients. Ahh-Spirations has consolidated to the Oakland location. Any unredeemed certificates can be used in Oakland. Otherwise, call 402-681-3902 for other arrangements. Calm your world. Call today and enjoy your AHH-hour! Introducing Sacro Wedgy® - 30 minutes of relaxing and stretching on the wedgy to help relieve sciatica, back/hip pain, piriformis syndrome, etc. - 30 minutes for $35. © Copyright 2019 Ahh-Spirations Therapeutic Massage. All rights reserved.